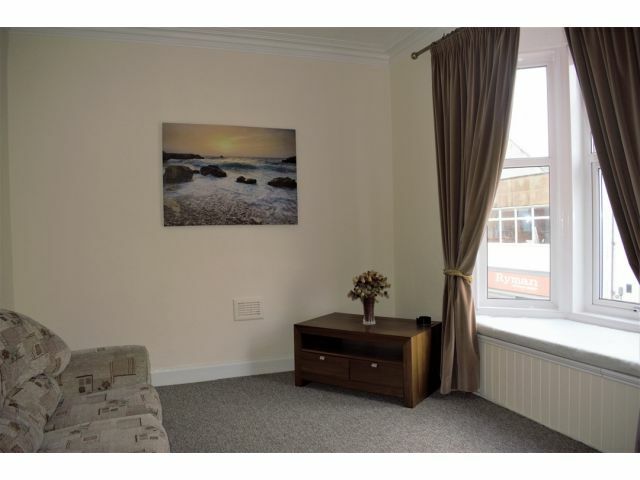 Providing Lounge with bay window, Kitchen, Bathroom and two Bedrooms. Window to side with blinds. Two ceiling lights, smoke alarm, storage heater and carpet flooring. Bay window to front with curtain pole. Coving, ceiling light, smoke alarm. TV and BT points, storage heater and carpet flooring. Window to rear with blinds. Coving, ceiling light and smoke alarm. Storage cupboard. Wall and base units, integral electric oven, four ring electric hob and cooker hood with extractor fan. Plumbing for washing machine and dishwasher. Space for fridge freezer. Stainless steel sink and drainer with mixer taps, tiled splashback. Tiled flooring. Bay window to front with curtain pole. Storage cupboard. Coving, ceiling light, storage heater and carpet flooring. Window to rear. Coving, ceiling light, extractor fan. Sink set in to vanity unit, WC, bath with over bath electric shower, tiled walls and flooring. Window to rear with curtain pole. Storage cupboard. Ceiling light,, storage heater and carpet flooring. The apartment is accessed from a secure gate at the rear of the property. There is an area on the first floor where seating could be placed or a selection of planters and pots. By appointment only – please contact our office on 01461 205690 to arrange a time, suitable for you. Out of office hours (until 9pm) – 07742537220. Offers in the region of £75,000 are invited and should be submitted to lj Residential, 93 High Street, Annan, DG12 6DJ or by fax to: 01461 205037.